While all eyes are on Titanfall, a rather different kind of shooter is about to sneak in the back door. But will Plants Vs Zombies: Garden Warfare hold your interest past March 11th? Popcap hit the big-time with Plants vs. Zombies back in 2009, a tower defence game that was addictive as it was cute. The success of the game saw it spread like wildfire across multiple platforms, starting on PC and swiftly moving to smartphones, tablets and handhelds, breaking sales records along the way. Now, five years later, the conflict between the undead and the foliage has broken into full-scale war. What started as a compelling tactical time-killer has become a fully fledged triple-A third person shooter. Is it good enough to stay in your disc tray, though? The basic premise of Garden Warfare pits plants against zombie in a battle for survival in the backyard. The game integrates the strategy and resource management from the original tower defence game and then ties it to the skill aspect of a third person shooter. This balance depends on the mode you jump into. Garden Ops is a 4-player co-op mode that feels almost identical to Gears of War's Horde Mode, minus the chainsaws and globules of claret splattering the across the screen. The premise is simple: Pick a spot for your garden, set up defences and team up to fight wave after wave of zombies. Like Horde Mode, it's fun - but it's unlikely to hold your interest for too long. If you're after something a little more Player vs Player (PvP) oriented, you have two options. Gardens and Graveyards works much like Conquest Mode in Battlefield 4, with plants defending their territory from oncoming zombie hordes. Team Vanquish is basically your tried and tested Team Deathmatch mode. Taking another leaf from Battlefield 4's rather large playbook is Boss Mode, an Xbox One exclusive that acts rather the same as BF4's Commander Mode, letting you take a back seat and lavish health drops on your friends and air strikes on your foes using Kinect or the Smartglass app on your tablet or smartphone. One giant plus point in Garden Warfare's favour though is its split-screen multiplayer. Ok, so it only supports Garden Ops's co-op, but it's a step in the right direction. Long live split screen multiplayer, and well done to Popcap for including it when others find it so easy not to bother. As you play through these modes you'll earn coins, which can be used to buy varying quality sticker packs (along the same lines as FIFA 14's Ultimate Team Mode) containing new spawnable plants and zombies, weapon upgrades, character accessories and sticker parts for new characters. So, there's plenty to be getting on with. But none of the game modes feel wildly unique and if you don't have a decent-sized group of mates to play with, the only thing that will keep you coming back regularly is the need to collect more stuff from the sticker packs. If that's an itch you don't need to scratch, this isn't going to keep you interested. Jump into any of game modes (with the exception of Boss Mode) and you'll have a choice of four classes on each side. The plants have the nimble Peashooter soldier, the burrowing Chomper, the Sunflower healer and the Cactus sniper. The zombies counter that with the front-line Foot Soldier, the spanner-wielding Engineer, a teleporting Scientist and a Gatling-armed All-Star. Because many of the zombies are equipped with rapid fire weapons, they're initially much easier to play and tend to have an advantage, but as you unlock the many special abilities of each class, the game moves from being a bog-standard third-person shooter to something rather more interesting. Though initially limited to running and gunning, Peashooters can later become entrenched Gatling guns, forming devastating firing lines. This makes them easier targets for the All-Star miniguns and Foot Soldier rocket launchers, but a single Chomper can dig into enemy lines and take out a key target to swing things in the plants' favour - unless a zombie Engineer is nearby to stun him with a sonic grenade. All the while, Scientists and Sunflowers are high-priority targets, scampering around keeping health levels high. We can absolutely see the complex dynamics that Popcap was going for, and there's a Team Fortress feel to Garden Warfare that is inescapable. The difference is marked, though. Team Fortress players understand the team aspect of the game, and new players buy into that very quickly because the alternative is constant, abject failure. 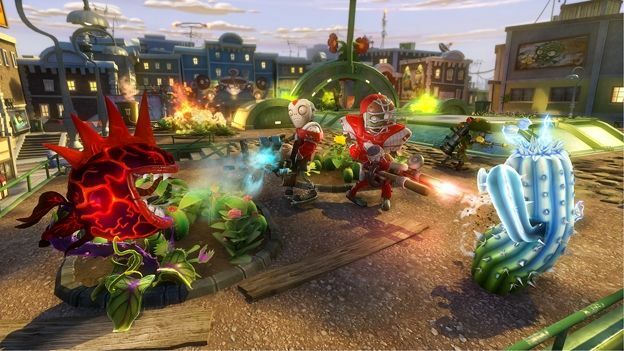 Garden Warfare is a little more forgiving, and the team dynamic isn't really paramount. The result is a multiplayer shooter that's unquestionably fun, but doesn't really hold our attention for more than a few games. It only really comes into its own when you're playing with a group of friends. Who's to say if Garden Warfare players will ever realise Popcap's vision for the game? We hope they do, because there's definitely potential for this to be really good fun, but in our limited time with the game for review we only had glimpses of the potential, and never really experienced it. Garden Warfare is a very clean looking game. Environments and characters are crisp as you move around, and lovely to look at. We're not sure how taxing the art-style is on next-gen hardware, but it is definitely to the game's credit that it runs so smoothly, even when there's a lot going on on-screen. Garden Warfare is an incredibly difficult game to judge. There are so many reasons to like this game, from the cheerful art-style to the typically gentle humour and clever team mechanics. But we're not sure that it all comes together enough to warrant this being a triple-A title. The best shooters are furiously addictive and Garden Warfare just doesn't grab your attention in the same way. Each game mode is fun, but limited and there isn't a great deal of variation between them, which leaves the game feeling a little lightweight as a whole. That said; there is a lot of potential for this game to grow into something great, as Team Fortress once did. But for the moment, we'd definitely recommend that you try before you buy.